I love camping, hiking, fishing and the great outdoors. At the end of the day spent out enjoying nature, there is nothing better than sitting by a nice warm campfire and toasting some marshmallows or some other camp food. However, building the fire can be a joy… OR a pain in the ….. back, if you have the wrong tools. I have had a few hiking & camping axes/hatchets in my time. Some were OK, some were crap and a few were really great. I wrote this article about the best axes & hatchets for camping, backpacking, hiking & survival to help others choose a good one. 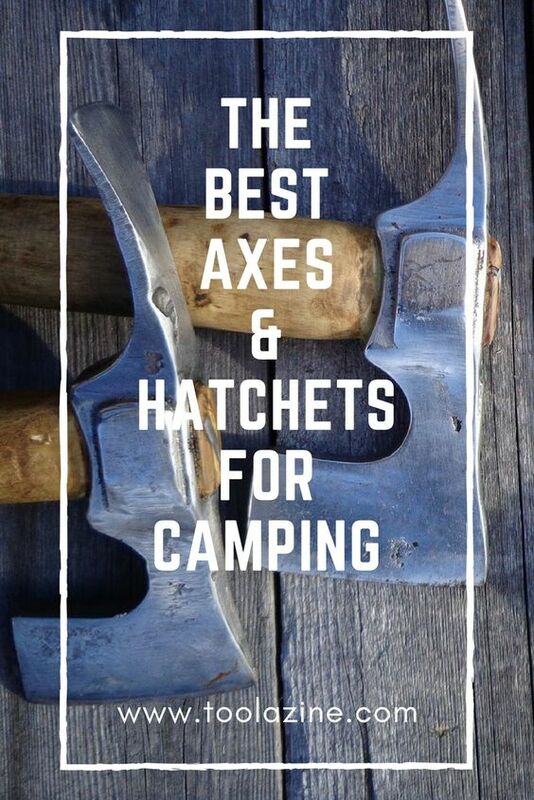 Keep reading below for full reviews of these and other great axes and hatchets. So here it is, I hope that you like it. Let me know what you think. Please share this! What’s the Difference between axes and hatchets? What are the different types of hatchets? What are the safe ways (safety tips) to use a hatchet or axe? What is the recommended safety equipment for when using an axe? As you can certainly see from the table listed above, the hatchets are fairly different in weight, length, cutting edge as well as the manufacturer. All of these, however, are important when it comes to choosing one that suits your needs. Keep reading below for a review of each of the listed models. So, without any further ado, let’s go right ahead and take a look. This is undoubtedly among the most popular options and it is my recommended hatchet for backpacking & hiking. This is a quality tool brought to you by Gransfors Bruks. The unit is very practical and you can easily carry it in your rucksack for when you need a smaller sized option. However, the Gransfors Bruks outdoor axe still brings quite a lot of power. The blade is razor sharp and it comes like this from the factory. The hatchet is nice to hold with a quality well-shaped wood handle. It is a pleasure to use and chop wood with. I rate this as the top performer out of all of the different hatchet reviewed. This is a hand-crafted product (with Swedish steel) which undoubtedly brings the artisan, tailor-made appeal on the table. Additionally, you can be sure that the little beast is thoroughly capable and easy to use for lopping off substantial branches and splitting smaller logs for your campfire. It is the perfect size to use for backpacking and hiking where you know that you will be chopping some wood. It is also sturdy enough that you handle virtually anything. The Gransfors Bruks small forest axe is another outdoors axe that is a bit bigger than the camping model and would suit car camping. The Gransfors Bruks camping hatchet with a knife and folding hand saw. This Gransfors Bruks wildlife hatchet comes with a sheath. The shape of the sheath is quite convenient and it covers the entire sharp edge as well as the top part of your handle. This will help prevent any potential damage when carrying it in your rucksack. This is as good as a hunting solution and it is undoubtedly my personal favorite. The Gransfors Bruks wildlife hatchet comes with a satisfaction guarantee. In my personal opinion, the weight in this model is perfectly balanced, which is great when you are swinging it around. This is a well crafted, high-quality tool which is likely to last you a long time. The Gransfors Bruks wildlife hatchet is available on Amazon. The Gransfors Bruks is super high quality from the best materials. You can see how they hand forge axe heads and fit them with a handle in this video. This is another product which has received massive recognition and splendid feedback. It’s a good sturdy model that you use camping, backpacking, hiking or in a survival situation. You can use it to split wood, to hammer and for a range of different rough uses. This model stands up well under a range of use and abuse. If you are looking for a hatchet which is going to last you for a lifetime, this is a good choice. The product feels very nice in your hand and the balance is quite good. You would never have to worry about the potential of loosening of the head as the steel head and handle are forged in one piece. The design is compact, sturdy and it makes this a flawless hatchet for a range of different purposes, camping being the top priority. The balance as well as the heft are properly thought out and they are the right fit for anyone, regardless of his purpose. This is undoubtedly a great hatchet for your outdoors undertakings and it’s incredible to use it around the house as well. The Estwing hatchet is also quite strong – it is forged in one single piece all of which is steel and there is a genuine, high-quality leather grip. The tool is entirely polished and the grip and sheath make it even more comfortable. The steel is of the highest quality and it’s going to hold the edge flawlessly. Obviously, you wouldn’t have to worry about the head getting loose. It is very easy to sharpen it also. This is a unit that you might never need to replace and this is definitely something worth accounting for. Made in the USA. This is my personal choice for a backpacking hatchet. You can buy the Estwing E24A here. The Estwing is a quality brand. They products have proven to be incredibly durable, reliable and multi functional. They have made a tremendous impression on users. With this in mind, I would like to review another one of their products. The E44A model is a bit different from the previous one (the smaller and lighter Estwing E24A). The main difference is the length, weight and grip. The E44A comes with a rubber, shock-reduction grip. Now, a lot of people may argue which one is better – a leather or a rubber solution. The truth is that both of them have merit and it’s mainly about being able to determine what works better for you. The E44A is another one-piece forged axe which is made out of high-quality cold steel. The steel head and handle are forged in one piece and they are highly polished. The Estwing E44A is renowned for holding its edge and it has good overall feel to use. The weight & length is slightly more than the E24A which makes it a more effective chopping tool but not as desirable to carry if you are taking it backpacking or camping. Even though some like this model for backpacking I’d stick with using it for camping trips where you don’t need to carry it far as it’s not as easy to fit and carry in a pack. On the other hand, it’s likely to handle most camping and backpacking wood chopping & splitting needs that you may have and this is big benefit making it a good versatile multipurpose axe if you don’t mind a bit of extra weight in the pack if you can get more versatile use from it. Made in the USA. This is my favorite all round hatchet. Check the latest price and get the Estwing E44A here on Amazon. Brought to you by one of the most reliable manufacturers in the industry, this is a 13-inch hatchet which is designed with simplicity and durability in mind. This Husqvarna option is made out of two separate pieces, one for the head and one for the handle. Starting off with the handle, it’s made of Hickory wood which is considered as the best wood type for axe and hatchet handles. It has a splendid look as well as ergonomic feel thanks to the curved handle design. This makes the product feel really good in your hand. At the same time, it’s light but not too light and it provides substantial swinging and chopping power. This makes it a good option for both camping and hiking with a pack. This Husqvarna model is also quite affordable and it is on the lower end of the price list, giving you splendid value for the money you pay. The steel blade / axe head is hand-forged in Sweden and it’s made out of strong steel which is bound to last for years. The edge is razor sharp and holds its edge well. It is protected by a leather sheath which fits snugly over it for your safety and so that you can avoid cutting up your pack and the stuff that you may have in it if you are taking it hiking. The leather sheath is also included in the price. The entire unit is great and it manages to bring that authentic appeal which is missing in a lot of contemporary hatchets. Here are some of the pros and cons of the unit. Did you know that Husqvarna makes some really good quality chainsaws? Check out the different Husqvarna chainsaw models. The first thing that needs to be said about the Wetterlings hatchet is that it’s a straightforward hiking and camping model. It is compact, small in size and easy to store but it’s not going to provide you with all the heavier-duty capabilities that you’d need if you have a lot of wood or large pieces of wood to chop. This is a hand crafted hatchet and it is made by one of the used-to-be-biggest axe manufacturers in the country of Sweden. It originated all the way back in 1880 and it is well regarded in the industry. However, since they are focused on hand-crafted solutions, they haven’t scaled as much. This only brings more value to their products as each and every one of them is made with precision by artisan craftsmen. Starting off with the specifications, this is a two-piece traditional camping hatchet. The handle is made out of wood and the head is forged of strong steel. The edge is razor sharp and holds its edge well. It comes with a leather sheath which is included in the purchase price. This is quite convenient, it gives your axe a nice appeal and allows you to store it safely when camping. The handle is curved in an ergonomic shape which allows you to swing it in a well-balanced manner without tiring out your hand. This is quite useful if you are chopping or splitting wood for a while. Additionally, this is a small-sized unit which is going to fit within your backpack without any hassle due to its compact size and lightweight. The thing which impresses the most is that you get a handcrafted unit which is unique and of the highest quality. Fiskars is undoubtedly one of the leading global suppliers of branded products for your home, for your garden and for the outdoors. The company is also amongst the oldest ones in the field of axe making. It was founded back in 1649 in Finland and it is regarded as the oldest company in the entire country. It goes without saying that it’s more than just a reliable manufacturer. This particular product is one of the fastest selling products in the category and it’s also an award-winning one. The design of the hatchet managed to win the “International red dot” “best of the best” award. The category was garden and the competition was held back in 2010. While a lot has changed since then, this remains one of the best small to medium-sized chopping hatchets. This is obviously a high-performance unit because chopping medium logs requires some serious power. The handle is made of a synthetic material like some kind of glass fiber (glassfilled nylon), not wood like some of the other hatchets, and is very durable. This is the result of using patented FiberComp. The handle is super strong and isn’t going to break when used and abused under normal circumstances. If there is one thing that should be emphasized, it’s the seemingly indestructible handle. The unit offers great weight balance that results in a good power to weight ratio. That is the weight is all in the right place (towards the head), which increases the chopping & splitting efficiency. The head weight of the x7 is 1.28 lbs (581 g). This effectively multiplies the perceived power of this hatchet, much like a baseball bat made out of aluminum. Furthermore, it has a non-slip grip which is specifically intended to reduce hand strain and to enhance your control. The Fiskars X7 is one of the best axes for the money that you will pay. If you want to clear a bush on the path this particular unit will help you out. Also if you need to chop some medium sized logs for your campfire, this is a model that will get the job done. The edge is factory razor sharpened but can dull easily. Check out my article about how to sharpen your axe or hatchet. This is still one of the best options that has a very competitive price point. 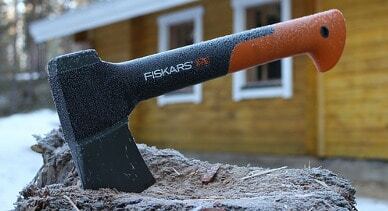 Check out my review if you want to know more about the x7 or other Fiskars hatchets, axes or splitting maul. Check latest price of the Fiskars X7 on Amazon. Gerber is a company which has a long-standing history as a successful outdoors equipment company. It is currently a sub-division of Fiskars but it was founded all the way back in 1939. It’s a native USA company established in Portland, Oregon. The name carries the reputation of one of the most famous survival experts – Bear Grylls. Now, kicking it off directly, you ought to know that this particular small hatchet (hand axe), the Bear Grylls Survival hatchet, is one of the coolest things that you would want to have in your bug out bag. It is smaller than the majority of hatchets and it is bigger than the regular survival knife. You will be able to handle a myriad of different small tasks easily. You can also use it in reverse as a hammer as the full tang construction makes for a great hammering head. However, if you need to cut down a small tree, for instance, it might be a better idea to use a hatchet with a handle that’s longer than this one. Of course, this would also enable you to do so but it would take a lot more effort and time. The greatness of the bear grylls survival hatchet lies within its compact dimensions. It is a compact camping & hiking unit which has a full tang construction with the head and handle forged a single piece (the handle also has a hand grip covering). The steel handle is wrapped with some kind of very comfortable and particularly ergonomic rubber grip which is going to give you a stronger hold, even if the axe is actually wet. There are finger notches which are just below the head which help you to safely maintain your grip and chop wood without it slipping out of your hand and causing an accident. The bear gryll survival hatchet is a good little compact tool. You can use it for hammering (with the back of the blade) a range of different things (tent pegs etc…). It’s a good compact model but not really my favorite due to the short handle and slightly awkward weight distribution. This is an ok unit to be used for backpacking and even for hiking as a just-in-case tool rather than something to bring if you know that you will be doing some chopping. If you just want something small to take with you hiking, just in case you needed it then this is the one that you want. This is a tiny little hatchet which comes with a stainless steel blade as well as a slip-proof handle. It is best suited as an emergency / just in case lightweight hatchet. That is just packed and forgotten about. NOT a hatchet you bring if you know that you need to chop or split some wood. When it comes to the quality of the unit, you can rest assured that this is a solid one if only a lightweight one. It is made out of a solid metal one-piece design. The axe arrives incredibly sharp right from the get go and it is known to hold its edge well. It can take quite a lot for you to actually dampen the edge of this hatchet when being used on light tasks that match it’s lightweight. Going further, the WatchFire hatchet is particularly light and convenient when it comes to backpacking. It is also heavy enough to help enable you to chop smaller size pieces of wood. All in all, the weight balance is ok. It’s a great solution for camping and for hiking. This is a unit which is geared towards those of you who would love to camp out or take on day hikes. This is mainly thanks to the fact that it’s designed to handle quicker jobs and not those heavy-duty longer chopping. It’s not ideal as a heavy duty unit as it’s not going to deliver the necessary weight to enable you to cut serious wood. If you are looking for something that would enable you to create tinder for your campfire, this is the unit to go. It’s definitely suited for slicing kindling or for cutting smaller branches as well as brushes. The ergonomic grip is quite good quality which is an additional feature that you would want to take into account. Also, it has a sturdy ballistic nylon sheath which doesn’t bring the appeal of the leather but it is durable and reliable. It will protect the edge from getting damaged and it would protect your other gear if you carry it in your backpack. It is very easy to carry and it comes with a convenient belt loop for added comfort and utility. As you can see, this is a good lightweight option and it is one which is geared towards those who may need to cut wood but are prioritizing lightweight over a more efficient wood cutting tool. It is not my favorite, just because I could not get used to the curved blade. If you think that the curved blade will not worry you then this could be a good hiking hatchet for you. Right off the bat, this is one of the most compact hatchets out on the market. It measures only 7 inches in length and it will fit in a pocket of your backpack, that’s for sure. At the same time, it also offers splendid control and balance. This is mainly thanks to the thermoplastic rubber handle which has a strong ABS core. This is a one-piece hatchet as a lot of the others that I’ve decided to bring forward and it’s for a good reason. The main benefit of one piece options is that they are very reliable in terms of overall durability. This particular one is finished off in black color, giving it a nice appeal which, of course, is also something important even though it’s probably not a determining factor. The grip is non-slip and stable and it would allow you to control it perfectly. In terms of materials, the head and the blade are made out of 3Cr13 steel. The black coating that we mentioned isn’t just for the beauties – it’s also protective. In any case, the Outdoor Edge Wood Devil is a great option as a hiking hatchet which is also capable of helping you a lot around the camp. Of course, it’s not intended to be used as an everyday household item. The Estwing Special Edition E45ASE 26″ Camper’s Axe, the special edition of the Estwing E45A campers axe, is a great camping axe by a great company. This campe’s axe, like the other Estwing axes and hatchets is made in the USA. It is quite similar to the Estwing E44A hatchet (that I have rated as the best versatile camping and hiking hatchet) but the E45ASE has a longer handle and black finish. 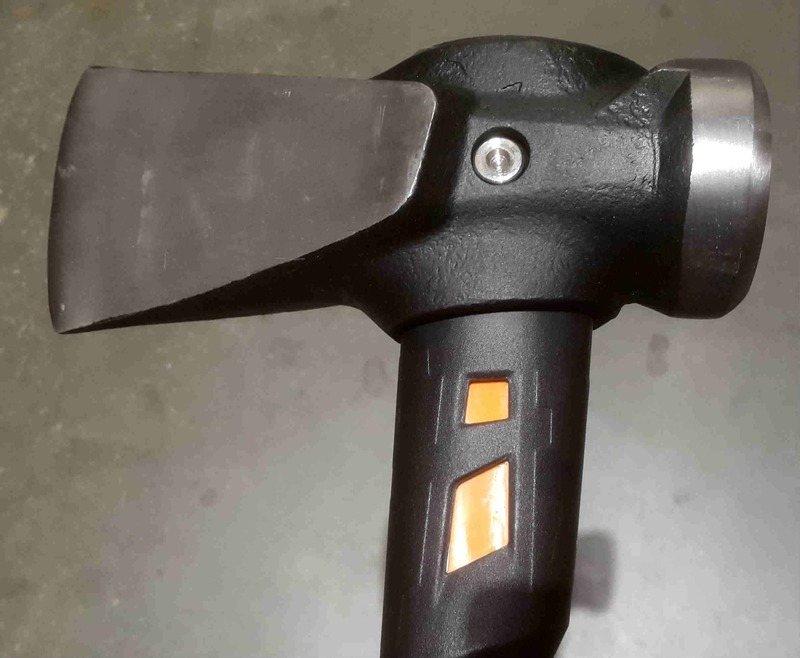 The longer handle on the E45ASE means that you can get a greater amount of leverage and power when chopping than the E44A hatchet but the longer handle makes it not as convenient for carrying. For these reasons it makes it a great car camping (or other camping where you don’t need to carry it very far) axe but not as good for hiking. Weighing about 5 lb. it has a bit of weight in it but not very heavy. This axe has a 4″ blade edge and is 26″ length. Forged from American steel in USA. Needless to say, browning is amongst the most recognized manufacturers on the market and that’s all for a lot of good reasons. This particular axe is splendid for a range of different purposes. The only thing that you would have to consider is that it’s a bit larger than the conventional choice. Most of it is the handle but this shouldn’t really stop you from giving it a fair shot as when you start swinging, you’ll see where the magic comes from. The handle itself is made out of fiberglass and polypropylene. Now, it is not as durable as metal but it’s also a lot lighter, making it better for transportation. At the same time, it will outperform the majority of regular wooden handles without the slightest effort. The edge is particularly extruded and it is guaranteed to last for a lifetime. It is factory razor sharp and it’s protected by a extruded nylon sheath which is going to protect it from getting nicked when you’re not using it. The Browning 231 Outdoor Axe is more suited to car camping than any kind of camping where you need to carry your equipment any distance due to is weight and bulkiness. It can be a really great option if you will need to chop and split a lot of firewood due to its larger size. This axe is made in the USA! As you can see, there is a tremendous amount of different choices on the market and the important thing is that you should pick one which is best fit for your needs. I hope that the information that I’ve provided you with will enable you to make the right call in choosing the right one for your needs. Additionally, I’ve brought a few particularly well-received and high-ranked options which are priced fairly and provide a tremendous amount of value to your hiking, backpacking, camping or survival kit. 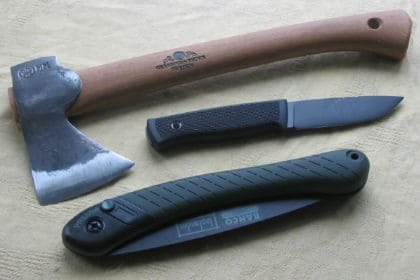 There are a lot of different things that you ought to consider when it comes to picking the best axe or hatchet for hiking, camping, backpacking or bugout bag but knowing a bit about axes and hatchets can help you understand them better and then understand what makes a good or bad choice for your needs. If you want a suitable wood chopping tool for your needs, it will help you to understand the different parts, different types and different features of an axe or hatchet. This will leave you better informed when it comes to selecting one that is better for camping, backpacking and survival in general. The main point of this comprehensive buying guide is to make sure that you are capable of easily picking up the best axe & hatchet designed for backpacking and camping. Therefore, we will leave tomahawks aside as they aren’t something that we are currently interested in. Here we are discussing hiking, backpacking and camping axes and hatchets. If you are going into the wilderness (even other activities like water sports canoeing, kayaking or fishing) you may well find yourself in need of a fire and therefore firewood. You may also have other need for chopping trees or wood, for example if you want to use branches to make a shelter or for some other camping stuff. In this case you could use a chainsaw or an axe or hatchet. Chainsaws are big, bulky and heavy, they also need gas, power or batteries, which can make them unsuitable for camping and especially unsuitable for backpacking where every bit of weight counts to the extent that you even want to make sure that you have a small and lightweight sleeping bag. However, if you want to read about chainsaws you can read here about choosing the best professional chainsaw or here for the best homeowner chainsaw. Excluding chainsaws, you can choose from axes or hatchets. Hatchets are like small axes. Axes are bigger, bulkier and heavier than hatchets but are more efficient at chopping trees and wood. Hatchets are smaller and lighter (easier to pack and carry) but are less effective at chopping stuff. 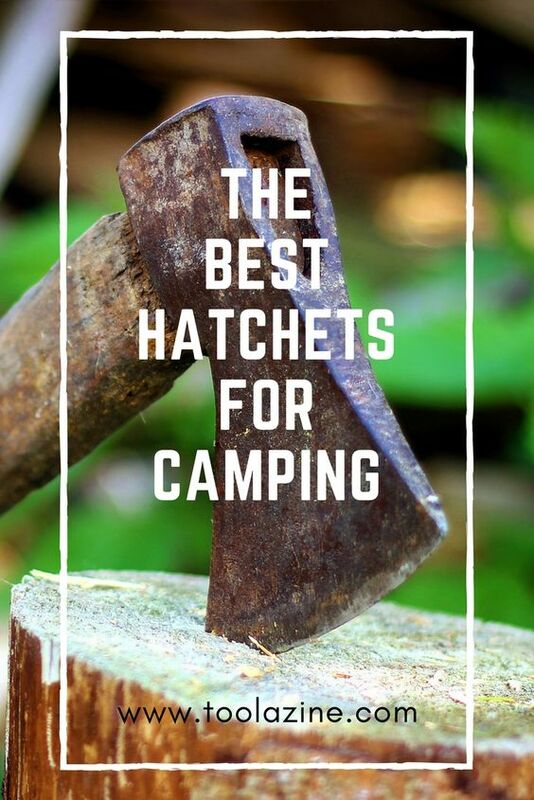 If you are going camping and will camp near your vehicle you are probably not so concerned with the extra size and weight of an axe compared to a hatchet. With this in mind, you ought to consider using a reliable axe that’s going to help you chop wood easier due to the longer handle and heavier axe head. In any case, there are quite a few aspects that you’d want to consider. Let’s have a look. The handle or shaft is one of the most important parts. This particular part was historically made out of straight-grained piece of wood such as hickory. Of course, as time passes technology advances, and now many handles made out of fiberglass, plastic or metal. The main purpose of the handle is to allow you to swing the axe/hatchet and direct the force of head onto whatever you are chopping. Obviously, it’s also going to take a beating and the handle is the most common part of the axe to break. Therefore, it is important to get a quality handle so that it will last a long time and will not cost you more to replace the handle. When you are choosing a wooden handle, for instance, it is important to take a note of the grain. This should be pretty much directed towards the blade because it is serving as the strongest orientation of the grain which will withstand severe force. If the grain is horizontal, the handle is going to be a lot more prone to breaking. Usually, cheaper axes have horizontal grains and this is one of the things that you ought to take into account when it comes to it – it is a great sign of whether or not the axe is worth your money. 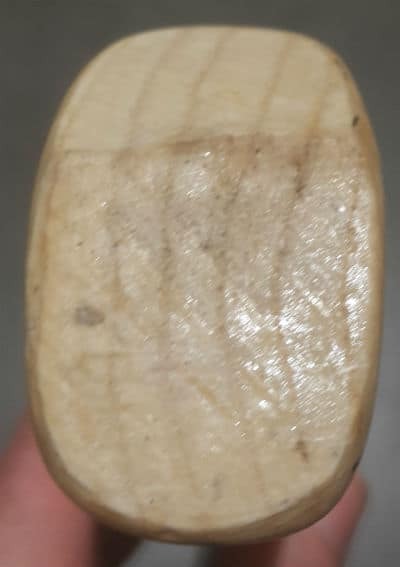 Example of a poor quality axe handle with the wood grain facing the wrong way. 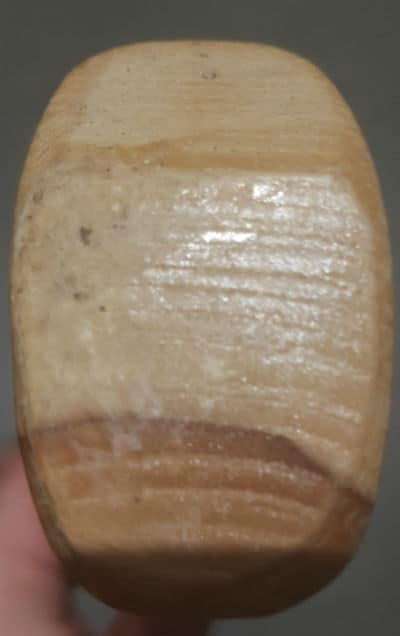 Example of a good axe handle with the wood grain facing the right way. The head is what’s going to slice the wood and provide you with the true firepower, so to speak. The best and the highest quality axes are those which have been mainly forged out of steel with a cutting edge made out of carbon – these are the things that you ought to account for. Just to make it clear here, the entire blade doesn’t really need to be made out of carbon steel. This is going to make the entire thing overly expensive and, if we have to give preference, you need to consider a low carbon steel for the head because it is going to provide it with an additional flex. This is the way Vikings used to make their axes, actually – high carbon steel cutting edge with low carbon steel head. The piece of carbon which is going to be conveniently inserted into the low carbon steel and forge are welded together. Keep in mind that stainless steel is considered to be an inferior product. There are certain issues which are made out of one single piece of metal and they come with a comfortable rubber grip which is conveniently attached to a metal handle. This is a preferred choice if you want firm integrity and an overly strong appeal of your axe or hatchet. Obviously, these are the most important things that you ought to take into account when you’re picking your axe. However, there are important additional things that you must certainly consider as well. While safety should always come first, using your axe accordingly is truly a thing to be aware of. The weight is obviously one of the most important things that you would have to consider. A heavier weight axe is going to provide you with more swinging and cutting potential and enable you to cut through larger, harder wood and do it easier. However, when you are backpacking or even camping you want to reduce the weight that you pack and bring, after all you will need to carry it. Therefore, the thing that you would want to look for is a balance between light weight and ease of use. The axe has to be light enough to be easily carried in your backpack or on your belt if you are looking for a backpacking or hiking unit. On the other hand, it has to be heavy enough if you are going to be using it for chopping larger wood. Of course, if you are looking for a camping axe to put in the back of your camping truck, you can ignore the carrying factor and pick up something that’s heavy enough to easily handle larger wood. Obviously, the weight balance is important but it’s not the only thing that you should be looking forward to. It is critical for you to feel the axe as it moves through the air and to be able to make heavy, centralized and laser-sharp blows to your target. The only thing which is going to attribute to that is the balance. This is mainly brought by the handle and its shape. If you will notice, a lot of the options that we’ve decided to bring forward feature a slightly curved design. This is not just for outside appeals – it is designated to ensure that you get the perfect shape for a balanced sensation of your axe. All of the axes and hatchets that we’ve brought forward come factory sharpened and they are truly going to cut. Obviously, the thing that you want to look forward to is how the axe will perform. Let’s be honest here, the main purpose of this tool is to cut. While some are also used to hammer down certain things with the back of their head, the most important thing to consider is cutting. Your blade needs not only to be sharp initially, but it needs to be durable and reliable. The worst thing you could go through is to purchase a brand new axe which is seemingly laser sharp only to find out that the edge gets nicked after a few harder blows. You would be left with no cutting power in the middle of the forest, wondering where you went wrong. Make sure that the edge will persevere and also see that it is made out of high-dense steel or metal. This is going to ensure that it stands the test of hard cutting and of time. Do you want to know the proper way to sharpen an axe or hatchet? Check out my article about the different ways to sharpen an axe or hatchet. Once again, in this particular category, it is quite critical to ensure that the solution you are going for will fit in your backpack. Sure, a lot of people prefer to carry them on your belt and most of the axes are truly suited for this. However, it is also important to note that the length, the same as the weight, is going to have a critical impact on the overall performance of the unit. With this being said, it is a general rule of thumb and of physics, for that matter, that shorter axes are usually preferred for quick tasks around the camp. For instance, if you only want to slice up some tinder in order to start your fire, a shorter axe would be the thing to use as it would allow quicker slices which are more controlled. On the other hand, if you want to chop the wood for this fire, you are better with a longer, heavier solution as it would physically enhance your cutting strength. This is quite important and you ought to account for it. As you can see, these are just some of the overall things to take into account. Of course, we are far from thinking that the aforementioned units are the only ones worth taking a look at on the market. As a matter of fact, allow us to introduce two more of these which are particularly good for backpacking and hiking. The main difference between the hatchet and the axes is that the former is a lot shorter than the latter. This is pretty much everything that makes them different. The actual difference, however, is quite substantial and that’s why it creates an entire category. A hatchet is usually going to be around 12 inches in length. An axe, on the other hand, could easily be more than 22 inches in terms of length. Now, because axes have longer handles, they are a lot more powerful and are capable of processing wood a lot quicker and easier. Nevertheless, they are larger and that’s why they are more space-demanding and they weigh a bit more. So, if you want to camp out for a longer period of time, an axe is the obvious solution. This will provide you with the necessary performance capabilities to ensure that everything is handled as per the highest industry standards. This will enable you to chop wood for fire without any issues, and you would be able to handle everything that you desire. On the other hand, if you are going backpacking and you want the added support of a cutting solution, you ought to carry a hatchet. Obviously, this is the lightweight solution, and it’s going to provide you with a lot more convenience when it comes to it. This is something that you ought to consider. It will enable you to move quickly without any issues throughout the entire trip. Of course, we would have to go through the things which make a great axe and a great hatchet. Furthermore, we will also take a look at 10 products which are specifically intended for purposes of the kind. So, without any further ado, let’s go right ahead and have a look at the things to consider when it comes to purchasing an axe or a hatchet. Felling axes are for chopping down (a.k.a. felling) trees. If you want to chop down trees then a felling axe is what you are after. This type of axe is usually very sharp and have a thin blade. Felling axes usually have an axe head that weighs between 1kg to 2kg and a handle that is between 70cm to 90cm in length. A felling axe is also great for chopping trees that have already been felled into smaller bits. These are one of the types of axes that are more suitable for camping, especially when camping next to or a short distance away from your vehicle. They are less suitable for backpacking due to their larger size and heavier weight. A Hudson Bay axe is similar to a felling axe but have a smaller head, shorter handle and are lighter. The head is usually about 1kg and handle is about 50com to 70 cm. The Hudson Bay axe is also sometimes known as a 3/4 axe. The smaller size makes it great for chopping smaller trees and logs. A splitting maul (also known as a ‘splitter’) has a wedge-shaped head. Where axes are for chopping across the grain, splitting mauls are for chopping (splitting) logs along the grain. A splitter has a heavy head usually between 2.5kg to 3.5kg and long handle between 70cm to 90cm. A splitting maul is also often used with a metal wedge (which is like a splitting maul head without the handle). The wedge can be placed into a crack in the wood and hammered in with the back of the splitting maul. A splitting maul is not usually used as a camping axe unless a lot of heavy duty firewood is needed and in which case it is best used in conjunction with a chainsaw. Broadaxes, as their name suggests are broad, at lease the dead blade is. These are full sized axes. Historically, these axes were craftsmen tools and used in boat building and other carpentry uses. These are not for chopping trees or firewood and not suitable for camping for backpacking. These similar to broadaxes but smaller. They are as their name suggests, used for carpentry and not for chopping trees or firewood. Throwing axes have been used in medieval times as weapons. However, there is a trend now to use throwing axes for sport. Check out my review of the best throwing axes. There are three main types of hatchets: camping hatchets, tactical hatchets, survival hatchets. So, with this in mind, let’s go right ahead and take a quick look at some of the most common types of hatchets. The most serious consideration that you ought to account for when it comes to your backpacking hatchet is that it is small enough to fit comfortably in your backpack. This is imperative. In any case, the ideal camping hatchet is going to be comfortable to carry and particularly lightweight yet sturdy and able to do what you bring it for, that is to cut wood efficiently. The next category of hatchets that we find rather interesting is the survival one. A hatchet is one of the most important survival tools that you can get. What you will come to need in the ultimate survival situation is a little bit different and a lot more reliable than what you may need on a regular camping trip. You will need to get a survival hatchet which has to serve its purpose and undertake the challenge regardless of everything. Even a full tang hatchet has a relatively small percentage of breaking up. If the handle breaks you are unlikely to be able to replace it. This is why it would be a better idea to have a traditional hatchet which is sturdy and extremely reliable. This is something quite important. Tactical hatchets are commonly referred to as tomahawks or tomahawk axe. Even though we are not going to take a closer look at them as they are mainly used as weapons, it’s important to know that they do formulate a serious percentage of the market interest towards these solutions. Which one should you choose? Obviously, the answer to that is quite dependent on the purpose that you have in mind. Generally speaking, the best prepper will have a hatchet for each purpose just to be sure. With this in mind, you can have a survival one at the back of your trunk and a camping one ready to use with your other camping gear. This is quite substantial and you ought to account for it. Now, once we’ve seen the most important things that you ought to take into serious consideration, it’s also quite important to make sure that you get a proper idea of the options which are already readily available on the market. This is why we’ve decided to provide you with a few of the most comprehensive hatchets and axes which are currently for sale. We’ve based our research on the most important differentiating criteria in order to ensure that everything is handled as per the highest standards. This is something quite important and it’s going to make sure that you receive the full benefits of your unit. Throwing hatchets have been used in medieval times as weapons. However, there is a trend now to use throwing hatchets for sport. Check out my review of the best throwing hatchets. Axes and hatchets are not toys, they are serious tools. 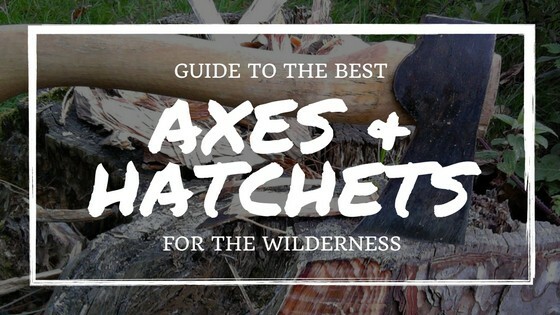 Here are a few hatchet and axe safety tips that could save you a lot of grief. Store it out of reach of small children. Teach kids how to use an axe the right way and supervise them. Use a sheath when it is not in use. Don’t chop with others nearby especially within swing range or where they could be hit if the axe bounces or glances off the wood you are chopping. Don’t chop towards yourself (think about your feet and legs here especially). Keep the area around your feet clear of tripping hazards. Stop when you start to get tired. Here is some axe safety equipment that you may want to use if you are seriously chopping wood. Obviously, taking all of this when you are backpacking or camping may not be a viable option. Before you start chopping about every wood around you, it might be a great idea to know a few things about wood. With this being said, it’s important to understand that different types of wood require different considerations and you should certainly make sure to be well aware of them. A dry and dead wood is without a doubt the best thing to look for when you want to chop wood to start a fire. You should place the branch and lay it in a stable manner on the ground once you find it. Use both of your hands to hold your convenient camping axe. Get the tool above your shoulder and quickly slide the top hand closer to the actual head of the axe. As the top hand slides right back conveniently to the base of the handle, you should get the axe right back down. This particular movement will provide you with the necessary accuracy that you need for chopping dry wood. It requires a lot less weight when chopping and it’s certainly something to consider. Keep in mind that it’s also appropriate to play with your cutting angles in an attempt to carve a convenient V shape in the wood. Once you manage to get through the halfway point of the thickness of the wood, you will be capable of turning it over and deliver a quick and heavy stomp, chopping the entire thing in two. It’s quite obvious that there are a lot of options that you can take your pick from and this is typical with survival gear. However, when it comes to the axe, it’s important to make sure that you choose a good one when buying it. It is an important piece of survival gear and it is difficult to replace with anything else. Sure, when you buy a machete you could potentially cut down a few small trees and bushes but you would have trouble to chop and split wood for your fire. The most important consideration is what you will be using it for and what you feel comfortable with. If you need an outdoor camping or survival axe where you will need to do some chopping, I recommend that you opt for a unit which is going to be longer, heavier and would deliver additional swinging power and cutting capabilities. For this I recommend the Gransfors Bruks. If you want a hiking or a backpacking unit, I recommend that it to be compact and mobile so that you can throw in your pack and forget about without it being a pain in the… back to carry. For this, I recommend the WatchFire hatchet at only 13 ounces you will hardly notice it. If you are car camping and have a bit more room and can take a bit more weight then a full-length camping axe may be the best option for you especially if you plan on having a decent size campfire. In this case the Estwing Special Edition E45ASE 26″ Camper’s Axe outperforms the Browning 231 Outdoor Axe. The Estwing Special Edition E45ASE 26″ Camper’s Axe is a great 26″ larger size axe that will make chopping and splitting a lot of wood more of a fun activity that a chore. If you are not really sure what you will be using the axe/hatchet for and maybe using it for a wide range of things then the Estwing E44A could be a good choice. It is fairly versatile and is a bit longer & heavier making it suitable for bigger chopping and splitting jobs and car camping but still a fairly compact tool. Now if you have looked at all these options and got scared off by the price and want a discount option then I suggest that you take a look at the Fiskars X7 it is still a decent hatchet but on the cheaper side. If none of the models here appeal to you then you could always take a look at the Gerber Gator Combo Axe II, Schrade scaxe2L, the MTECH USA Camping Axe or even the CRKT Woods Chogan Thawk Axe with Forged Carbon Steel Blade, and Hickory Wooden Handle. Finally, if you want something small that you can pack just in case the Klecker Knives KLAX lumberjack axe head is the Swiss army knife equivalent in an axe head with a bunch of different things but you may need to make your own handle. Hi, great review. I could not decide between the Gransfors Bruks and the Wetterlings so I ordered them both, one for each of my sons. I have a camping trip coming up with my two boys that will put them through their paces. Hi Peter, Thanks for your kind words, I hope that my review helped you out. I am sure that you will be happy with your decision. Both the Gransfors Bruks and the Wetterlings are great choices. Please let me know how you go with them on your camping trip. Hi, thanks for your review. I don’t do that much camping so I just went with the Fiskars X7. I have some other Fiskars garden tools and they are quite good value so I am sure that it will work out just fine. Hi Donald, Yes, if you are looking for a cheaper hatchet that is good for an occasional camping trip, then the Fiskars X7 is a great choice. Enjoy your camping trip! Hi there! I have Fiskars X7 and it is great. You are right about cons, but its still the best axe you can buy on a budget. I go hiking a lot and this axe is doing a job just fine, so it is worth it a little struggling with caring it.